Significantly changed from the previous iteration it now uses our own 3CB_Equipment and 3CB_Weapons mods packs. The Units mod is a mission friendly set of pre-configured sections, Fireteams, and groups of realistically modelled, attired and equipped Marines and Army Infantry units. We will be using this as our core units pack moving forward. Well done to the Mod team ! 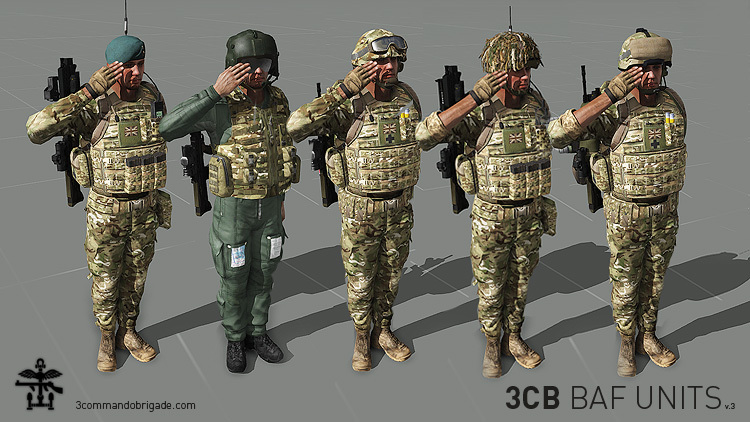 This mod now fully utilises our 3CB BAF Equipment and BAF Weapons packs. With over 100 units and a multitude of pre-built infantry Sections to choose from, it is easy to create whole Company sized formations for your missions. Not only that, but every Troop or Platoon will look unique, thanks to an automatic randomisation routine which equips each infantry-man in gear suitable to his role from the wide choice of kit available. If the @Ace3 mod is detected then load-outs are automatically reconfigured to use additional Ace items, including medical supplies, earplugs, map tools and other specialised pieces of equipment. So although @Ace3 is not required to run, these units are fully compatible with it. Although we at '3CB' are a milsim Royal Marines Commando group, we have also provided the full range of units in generic 'Army' MTP too (without Royal Marine markings) for our friends in the ArmA community to enjoy. Individual Units are available with Bergens (backpacks) to suit the deployment type - take the light Bergens on short "Day Patrols", or for longer yomps over multiple days, select the "Overnight" option with the heavy Bergens, which include the full kit of bedrolls, sleeping mats, entrenching tools etc. Pre-configured Groups are provided to assist mission makers with placing realistic infantry Sections on the battlefield. They come in several different configurations, representing the variety of weaponry available in the mod pack, and reflecting the often customised nature of gear found on Operations. An Editor module ('3CB BAF Unit Configuration') is provided for mission designers, allowing control of certain aspects of the equipment, such as whether gear randomisation is applied, what happens to gear on respawn, whether NVG's, GPS or Frags are available, weapon safety status and auto-replacement of magnified scopes with reflex sights. Great news and well done to the Mod Team - Looking forward to using some of the new gear!